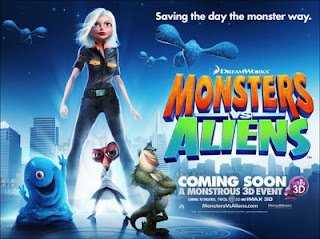 We took the kids the see Monsters verses Aliens in 3D on Sunday. It was fun, a bit scary for Nicola, she spent most of it sitting on my lap. I enjoyed it, the 3D stuff is good. Hugh Laurie aka House was the voice of the mad cockroach scientist, would love to see the gag reel of him doing the voice in the sound booth, bet he didn't just stand there as he does the evil laugh. I forgot to mention the Easter Bunny's visit. Apparently Nicola saw him!!! He is big & white & had to jump up Nicola's ladder to put her egg on the top of her bunk. I forgot to take a pic of Nicola getting her ears pierced, opps! Do you think I can take her back to the store just for a photo? I say go for it taking her back, I am sure they won't mind. I love the sound of that movie, might have to go along and see it. My baby is getting so big.